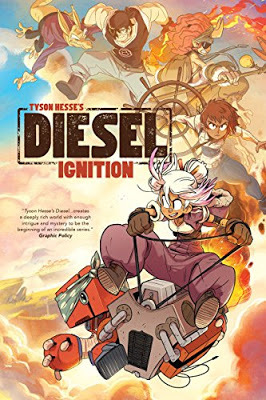 Observations: Diesel has an irresistible mix of fantasy and steampunk that is intriguing from the very start—part-animal/part-human characters like Bull, who is a sort of minotaur kid, and the Teppan, who are bird-people, as well as robots and flying cities and airships. The plot is full of continuous action and adventure, and the setting is incredibly cool—at the same time, the characters have problems with family and friends and responsibilities that are relatable. There’s also plenty of humor and a super cute robot sidekick who talks in little lines, like Woodstock talking to Snoopy. The themes brought in here give weight to the fantastical story and setting: the meaning of family, the types of trust issues that arise when someone is betrayed, the clash of personalities and goals that is inevitable in life but has to be dealt with. Thematically, this one will resonate with older teens, while younger ones will enjoy the overall action of the story. 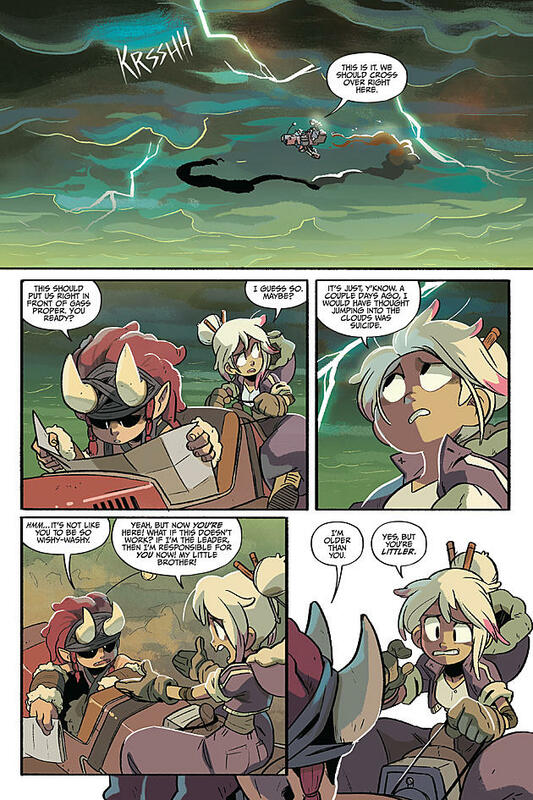 The art, too, is really wonderful, combining the fantastical with cute and funny touches, and a dash of manga influence—unsurprising, since the author/artist is also an animator who worked on a Sonic the Hedgehog game. Conclusion: I’m really glad the Cybils brought this one to me as part of this year’s YA Graphic Novels finalists—I don’t know how well-known it is, but I was intrigued by both the unique twist on steampunk and the fun characters. Book 1 also ends on a bit of a cliffhanger, so I’m hoping to read more. I received my copy of this book courtesy of the publisher for Cybils judging purposes. 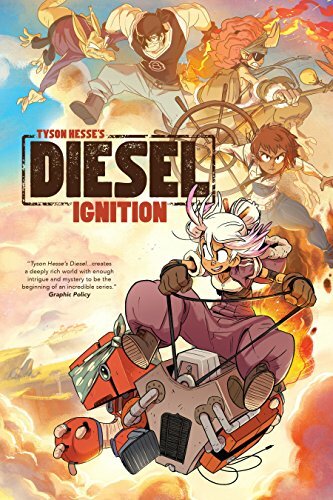 You can find DIESEL: IGNITION by Tyson Hesse at an online e-tailer, or at a real life, independent bookstore near you!